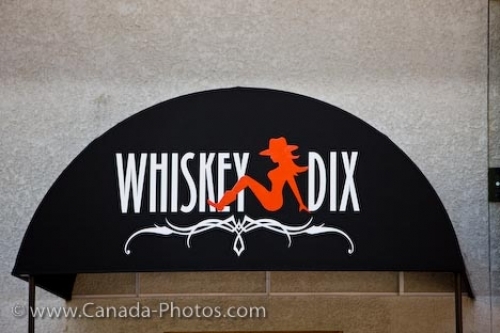 The black awning above the entrance to the club known as "Whiskey Dix" highlights the white lettering and red cowgirl on the sign in the City of Winnipeg in Manitoba, Canada. Situated in historic Exchange District in the City of Winnipeg, Manitoba is a club full of fun and entertainment known as Whiskey Dix. Near Portage and Main streets in the Royal Trust Company building, the black awning with the red and white sign advertising for this club is hard to miss. The club covers approximately 12,000 square feet where visitors will find live bands, recorded music, high tech sound, country dancing and 3 bars. A warm country atmosphere is always present at Whiskey Dix and all types of people enjoy a good time while at this club. Whiskey Dix Club (located in the Royal Trust Company building and the former Empire Cabaret) in the Exchange District in the City of Winnipeg, Manitoba, Canada. Picture of the awning with the sign reading "Whiskey Dix" outside the entrance to this club in Winnipeg City, Manitoba.